Discover the all-new Honda CR-V and find the small SUV that’s big on style and fantastic features for all to enjoy. Yours awaits you at Harrisonburg Honda. The incredible Honda CR-V is locked, loaded, and ready to please. The attention-getting style of the new CR-V is the first thing you’ll notice. It’s up to you what you want to discover next. With an impressive interior environment loaded with convenient features and cool tech, the possibilities are nearly endless. Take your time to explore them all at your own pace with the dedicated team at Harrisonburg Honda. The sporty, sculpted exterior design of the newest Honda CR-V definitely stands out from the crowd. From the completely redesigned front fascia with Honda’s Active Shutter Grille, all the way to the sculpted rear end, Honda has clearly raised the bar on modern, small SUV style with the new CR-V; and they’re eager to let you fall for this fantastic, highly aerodynamic ride. The William Mizell team is here to make a proper introduction. Stop in and meet the newest CR-V and take it all in. 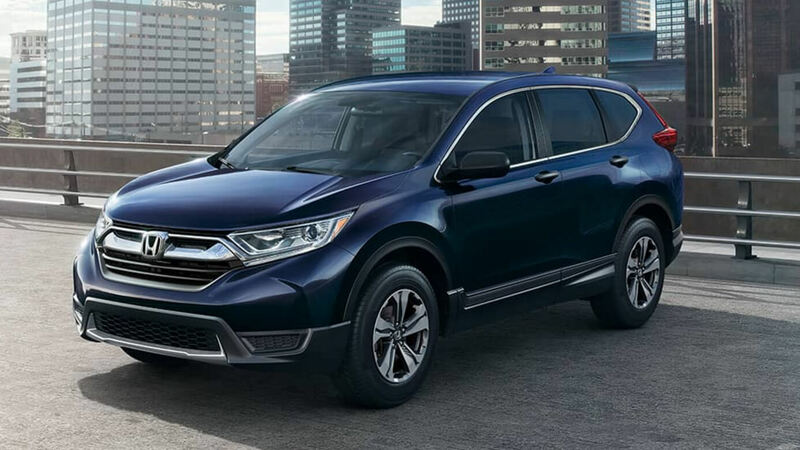 Your new Honda CR-V is extremely well equipped with incredibly advanced and imperative technology that keeps you comfortable, connected, and cruising safely along. Premium materials, like the available leather-trimmed and wrapped seating, steering wheel, and shifter elevate your CR-V’s interior to a truly cozy and surprisingly luxurious environment. Adaptive safety features like those found in the generous Honda Sensing package help to ensure you and yours stay safe and sound. HondaLink works to keep you completely connected to your world on the go, while your choice of several available audio systems, plus Pandora radio compatibility go the distance to keep you entertained every mile. Learn more about the Honda CR-V’s impressive tech and safety features from the professional team at Harrisonburg Honda. A large part in both looking good and feeling good behind the wheel of a car is all about performance and capability. The Honda CR-V features an available 190-horsepower turbocharged engine to give you the pep in performance you need. It also provides the control and capability you’re looking for with available Real Time All-Wheel Drive. You can rest assured that your CR-V can adapt to and excel in many varieties of driving conditions. Experience it firsthand when you take your test-drive at Harrisonburg Honda, and then we’ll make sure you can drive it home. If you’re searching for options in the new Honda CR-V, do yourself the favor of coming to the dedicated pros at Harrisonburg Honda first. Our brand of personal service and no-hassle atmosphere put you in charge, as you discover the perfect CR-V model amongst our incredible selection of new Honda vehicles. It’s time that you get the service, selection, and value that you deserve. It’s all waiting for you here at Harrisonburg Honda near Staunton, VA.
With this being my first car buying experience, I could not be happier. I worked with a very informative and charismatic dealer, Keith, who gave me all information up front and didn't try to hide any details. I would definitely recommend coming to this dealership. Service was outstanding. Service department seems trustworthy, the service advisors were SO friendly and helpful, and were completely transparent as far as what the cost would be. Even the shuttle driver was friendly and great to talk to. Outstanding service! Highly recommend and am very satisfied. Kyle did an amazing job selling me my new car! Made it super fast a pain free, in and out in a short amount of time! Thanks for being awesome and shifting me towards the car of my dream! I bought my 2013 Honda Civic from Tyler Rich last year on August 31, 2016 to get rid of my lemon of a car. Tyler was extremely professional and gave me an amazing deal on my car. He even put a full tank of gas and got it detailed for me!! It is now September 27, 2017 and I've put about 16k on her and not a single thing wrong with it. Thanks again to Tyler and H-Burg Honda for a great car and a very professional and friendly experience!! We had a great experience and I highly recommend Tyler Rich for any of your vehicle needs! He is awesome to work with and has continuously helped us with different questions and things since purchasing our new Accord. We will definitely be back to see him soon for our next vehicle purchase! 2009 Honda Fit airbag inflators were recall items - scheduled about 5 days out 8am - got there early- hour later heading out - noticed the stereo wouldn't power after the install a few hours of being on a couple business calls- came back they were very concerned with this - took it apart- found a loose wire and fuse popped- repair made and away we go. I had a good experience at Harrisonburg Honda and am very happy with my new car. Kyle helped me with it, and I really appreciated his friendly, down-to-earth style. I would certainly come back again! I've bought 7 vehicles from this place.... top notch place. They've always taken care of me. The service was top notch, from the start of the visit to the end everyone was friendly and helpful. The lady at the checkout noticed that I had an Armed Forces logo on my water bottle and when she realized that I was a veteran she refunded me the amount of the discount. She didn't have to do that, I would never have known and she was very respectful. Both thumbs up!! What an amazing experience! We drove here after having a negative experience elsewhere and I'm so glad we did. Though everyone we interacted with was helpful and friendly, Kyle, our sales associate, was the BEST! He was friendly, professional, informative, etc. The process was smooth and efficient and all of our questions were answered. We love Harrisonburg Honda!! We'd definitely buy another car here. We had an awesome experience with Harrisonburg Honda, particularly with Cristian Floyd. We walked in not sure what we were looking for exactly and left driving exactly what we always wanted. Cristian handled the whole experience with grace. We will certainly be back to buy our next car! Such a great car buying experience! Maria was amazing and the process was super smooth. After going to other dealerships, I can honestly say Harrisonburg Honda is the best all around. I look forward to working with you guys in the future and seeing you soon for service! Thanks again. So in love with my car!